This is my second time purchasing the Kitchen Aid food processor attachment. My original one was lost during a move. It attaches easily and is quick and easy to clean. Definitely a space saver, as I hate having a ton of small appliances taking up room in my cupboards. Streamline your food preparation process with the help of the speedy KitchenAid KSM2FPA food processor attachment and dicing kit. Capable of dicing, julienne cutting, shredding, and slicing, this 13-cup food processor easily attaches to standard KitchenAid mixers for your convenience. With six slicing settings from thin to thick, plus the option to cut uniform cubes, this food processor lets you customize everything to reduce your time in the kitchen. It's a great idea, but it's not really exactly what you really want that is unless you have a super-delux professional series mixer (my opinion). Does it do what it's supposed to do, yes; well kind of... I erroneously thought it would dice at different thicknesses; not so much it's only one thickness. When shredding cheese its underpowered (with my standard mixer that is). There are a lot of parts, which means a lot of parts to clean up afterwards... When you grate/chop/etc... and you gum up the blade be careful it will stop and turn in the direction that will literally OPEN the top causing it to grind to a halt (not really quick enough though). Lastly it's not a replacement for your chopper/processor on your countertop because you cannot make dough, mix things up with the quickness. It's more of a supplemental. I was excited, overjoyed, twitterpated to get it in my hands to FULLY utilize my mixer, but sadly for $** go and buy a stand alone. This is a great tool attachment for my KA mixer. Love how quickly it dices and slices up my veggies. The insert tube is a little small, so you may have to cut things in half beforehand. But for the price (especially in comparison to other dicing units), this worked like a charm. I have yet to test it on much besides harder vegetables. I'd like to see how it does on tomatoes next, and then meat and cheese. 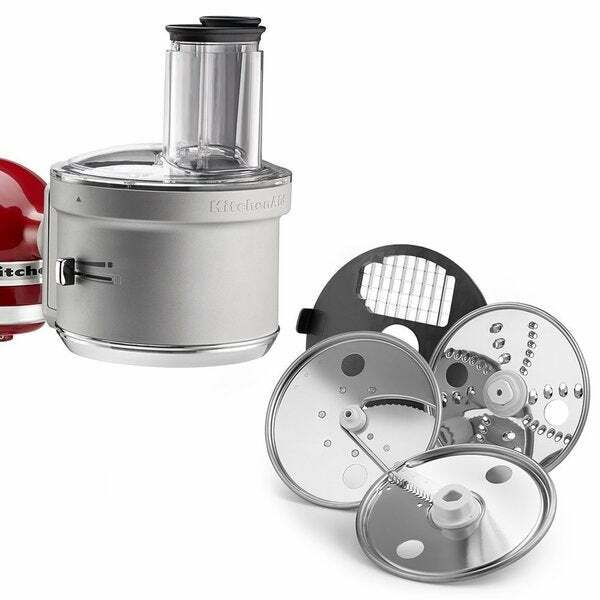 Also it should be noted that this is not like a traditional food processor that can basically blend items together in addition to slicing, but I can use my blender for that purpose. My main reason for getting this item was for the dicing feature, and that feature works like a charm, in my opinion. We found this item to be a pain in the neck. There are many pieces to deal with although they do come in a nice box to keep them organized in. The dicer was disappointing as it only dices 1/4" and you have to cut things very small as the feed tubes are small. The shredder is cumbersome to use also. I did like the slicer. The thickness selector works fine. However there is a not so small list of foods that do not work well with this device. It is no where close to being as powerful or quick as a counter top device. Given all the pieces and such I recommend a counter top unit. although I only spent $$$ for the processor with dicing attachments I say spend that money on something else as you probably already have a counter top processor anyway. As with most of the Kitchen Aid mixer attachments I find the processor lacking in ability to perform. And, what the heck...If you like it I'm happy for you! As for me...I'm sending it back. It does everything you need from slicing to dicing. Would recommend for every kitchen aid mixer! Love this attachment! I can slice, dice, julliene, and grate so fast! Big time saver in the kitchen! This is a great product. It is easy to use and easy to clean. I recommend purchasing this food processor attachment. This is perfect for slicing and dicing tons of things, especially since I'm not limited by the size of a food processed bowl. I love how little storage space it takes, and that I didn't have to buy yet another appliance. This is going to be brilliant come canning time. Goes perfect with my new KitchenAid I got for Christmas. We live low carb, so I'm constantly making zucchini noodles, cutting veggies, heating cheese, etc. This tool takes tons of time out of my prep work. I love that theres a storage box for all the blades. It's easily cleaned up, just pop the pieces in the dishwasher. It's so much easier than having a separate food processor that I have to pull down from a too high cabinet. My wife loves this attachment to her Kitchenaid. This is expensive and it is terrible. So much noise and worked only five times, than it shut down. Totally quiet and useless. I don’t think it was new when I bought it. Because of that terrible sound and so it stopped. I have wanted this forever, and I like it a lot. It cuts my vegetables into like sizes, and does it in a flash. Everything comes out in a uniform size. Talk about making food prep easy - this is awesome! We use this to meal prep veggies and it works great with easy clean up! Parts are well made and easy to store/use. The blades do not have any markings on them to advise what they are used for, so this is a little bit of a hassle, but all in all great and sturdy products. Mostly happy with this particular attachment. Only gripe is the processor portion, as this is not a sealed cup. It does not cut evenly. However, all of the other blades and attachments I do love. Takes a bit to get the hang of attaching but does exactly what it says it will. Was very happy to get my separate food processor off the counter. "Does this unit have it's own motor, or does it use the motor from the Stand Mixer, if so would I require an adaptor using it in Australia? Thankyou Marion"
Uses the mixer motor to operate. Not sure about an adapter.